Despite Sardinia counts some of the most wonderful beaches and coastlines on Earth, it’s definitely not a widely renowned and popular location between travelers and tourists in general, except for europeans habitué who spend here their summer vacations and cruise tourists who obviously don’t have time to discover the island. Fortunately, living in Sardinia for some months a year, sometimes I have the chance to organize an outing to discover and capture beautiful locations. Every corner of the island conceals a treasure, which changes shape and energy as the season changes. For this reason, sometimes a nice but not exceptional seashore or cliff shows its true beauty in different circumstances. In this case, when I went for scouting photography locations in the south-western coast of Sardinia during the last winter, I’ve been amazed by the beauty of a small cove in a place called Capo Pecora, but I had to wait until March to get the shots I had in mind, because the position of the setting sun was not yet where I needed it to be. Well, Capo Pecora, that literally means “Cape Sheep” is a beautifully shaped promontory where a succession of pebbly beaches, cliffs and coves generate a very heterogeneous landscape. It reflects the general appearance of sardinian coastlines, made up of a great variety of fine-grained beaches, steep cliffs and heavenly coves, which dive in a crystal clear sea, tinted by emerald and topaz shades of color. Believe me, the entire island is the paradise of every landscape and seascape photographer (for this reason, quite often I find myself wondering why I don’t ditch everyday’s nuisances and pack for an exciting and stress-relieving photographic excursion…). Capo Pecora is about 100 Km far from Cagliari (the capital city of the region) and it’s easily accessible by car; moreover, taking the coastal road is a nice idea if you want to enjoy some spectacular views of the western side of the island, included the fascinating old mining sites of the Sulcis-Iglesiente area (which now are abandoned but part of the UNESCO historical geominerary park of Sardinia, as well as anchor point of the European Route of Industrial Heritage). Once left the car at the clearing used as a parking lot, I took my photographic gear, heading for a particularly secluded area that I found in the previous scouting: on the edge of the cliff, a narrow and very steep fissure led me about fifteen meters below, in a small cove of pebbles, surrounded by many jagged rocks. At a first sight that hidden place may appear harsh or dangerous, but spending some time there makes you realize that’s a little marvel of nature: the tall rocks which enclose the cove represent a sort of amphitheatre that looks toward the sea, with the pebble shore as the point from where the observer can enjoy a wonderful sight. 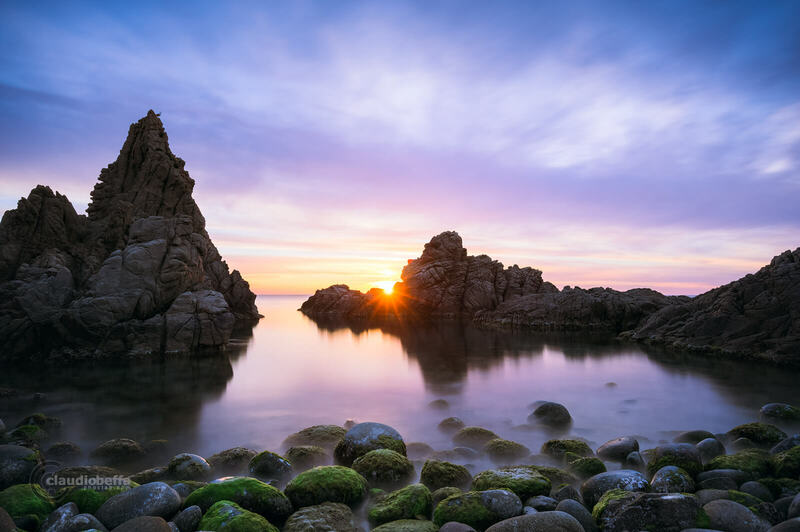 Just in front of the shore, a number of smaller rocks which appear on the surface of the water produces a multi-layered scene that enrich the sight and leads your eyes up to the horizon. The contrast between the natural elements was amazing: the calm and lucid water was gently brushing the pebbles and the sharp-cornered rocks and, at the same time, was reflecting the clouds drove by the fresh wind coming from the sea. When the sun started to set, the magic of the golden hour turned the cove into an otherworldly scenery; the last rays of light, passing through the irregularities of the rocks, made the surfaces of the wet pebbles shine, while the bright sky on the horizon emphasized the harsh silhouettes between the shore and the sun. 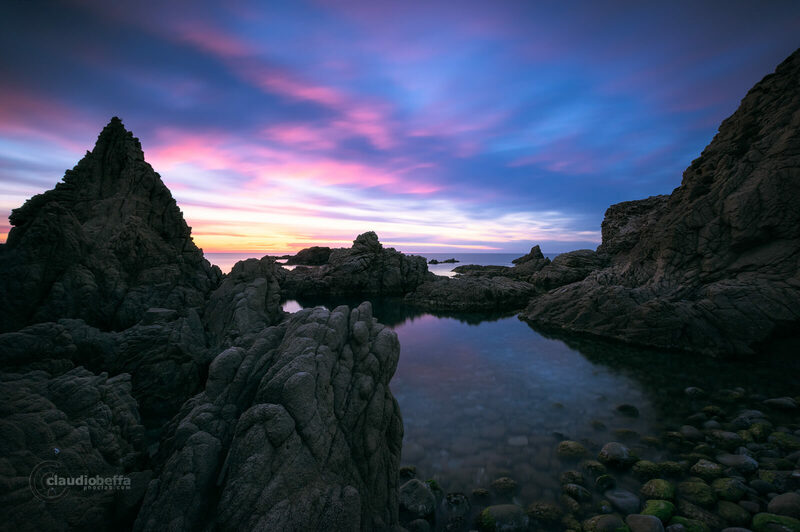 I captured this moment using my ultrawide lens, equipped with a graduated ND filter and the Big Stopper filter, which prolonged the exposure and accentuated the effect of light and colors on the scene. Some minutes later the landscape changed dramatically: the golden halo of sunlight decreased and the sky darkened, becoming deep blue. In that moment the lower sides of the clouds turned purple, painting a mesmerizing canvas above the sea; part of those vibrant hues mirrored on the almost still water of the cove. I was in an estathic wonder, practically hypnotized by such an amazing sight; nonetheless I seized the opportunity to capture it to the best of my ability. As the sun disappeared over the horizon, the fresh breeze which was blowing from the sea suddenly ceased, making the way for a lukewarm wind coming from the land, rich of scents of Mediterranean scrub. I can’t help thinking it was the breath of nature and perceiving it with my own senses gave me a feeling of peace and lightness. The light was quickly dimming, so I secured all my gear in the backpack and climbed up the narrow fissure to reach the upper cliff again. Getting back to the car to leave Capo Pecora, I deeply breathed the scented air of the night, with a smile of happiness and satisfaction on my face, hoping to live again such an awesome experience. Shoot RAW, not JPEG: a 14bit non compressed RAW file “contains” a huge dynamic range, giving you the maneuver space to recover the highlights and the shadows and to apply many adjustments without loosing details. Moreover it’s saved with a very wide color gamut, so it holds many more colors than a JPEG file. 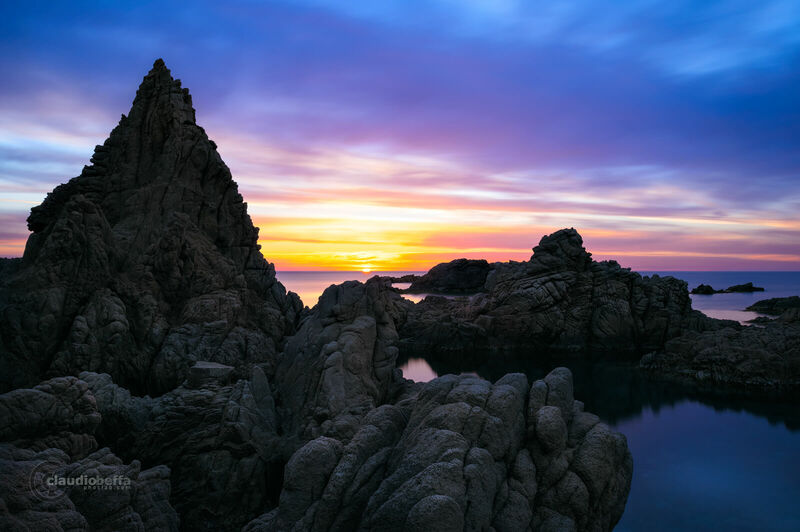 Use a graduated ND filter if the sky is too bright; doing so you’ll help the camera to capture the entire dynamic range without overexposing the sky or underexposing the ground and saving yourself the extra work of shooting bracketed exposures that you should blend on a retouching software. If you want to capture the movement of the clouds or make the water silky smooth, use a dark ND filter, like the Lee Big Stopper, but remember to put it in the first slot of the filter holder, close to the lens, to avoid light leakage. Moreover, since the Lee Big Stopper generates a cold color cast, I find useful to set the color temperature of the camera to “Shade” in order to compensate that bluish cast and make the postoprocessing easier. If you shoot long exposures with a DSLR, remember to shut the viewfinder in order to avoid light leakage through it. Work using the Live view, it will be easier also to obtain a spot on focus if your camera has the focus peaking function. Use a stable and sturdy tripod, because the smallest vibration can ruin a great photo. Use a remote control (better if that’s wireless, like the Pentax infrared model); in that way you’ll avoid any vibration generated by pressing the shutter button. Use the mirror-up function: you can set the camera to lift the mirror with the first press of the remote button, then to capture the image with the second press of the button. In that way you’ll avoid the so called “mirror slap” or “shutter shock” that is the vibration caused by the movement of the mirror. If you press the remote button to lift the mirror, wait a couple of seconds and then take the shot, you’ll obtain a pin sharp image, taking in this way full advantage of “resolving power” of your sensor and lens. Remember to always check the weather and to plan the excursion well in advance, using some useful apps, like “Plan it for photographers”, “Photo Pills” or “Photographer ephemeris”; doing so you’ll be able to choose more precisely the exact shooting point and the proper period of the year. I hope you liked this story about my photographic adventure in Capo Pecora and I wish you’ll find useful my technical tips, in case you are thinking to undertake a similar experience. Feel free to drop a line below, in the comment section, to let me know what do you think about this article, or if want ask anythink, or if you want just to say hi! Tra foto e parole descrittive dell’autore sembra quasi di vivere “Capo Pecora”. Leggendo tra le righe, e poi chiudendo gli occhi… l’immaginazione ti spinge verso un’esperienza singolare; Sardegna. Grazie “Claudio Beffa” per la tua passione. Grazie mille per il gentilissimo commmento, sono molto contento di essere riuscito a trasmettere parte delle mie sensazioni ed emozioni provate durante questa esperienza. Grazie ancora!